The tabloid sized Junior Mirror was published by Pictorial Publications beginning with the issue dated 1 September 1954. Edited by Donald Zec, it sold for an initial cover price of 2d, rising later to 3d, and was based on the long running weekly Children's Newspaper which had begun in 1929. 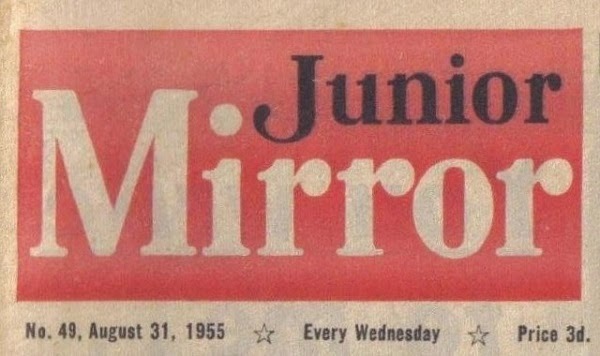 It used the newspaper format of its adult namesake, the Daily Mirror, and featured a few cartoon strips amongst its text articles. For the publication’s young readers the humorous Pip, Squeak and Wilfred strip would have been familiar as it had been running in the Daily Mirror since 1919 while the science fiction Space Captain Jim Stalwart, the canine Flash The Wonder Dog and the western Fighting Tomahawks were new. The Junior Mirror published three Space Captain Jim Stalwart stories, The Fantastic Adventures Of The Missing S.200, The Green Star, and the incomplete Pirates Of The Spaceways! Space Captain Jim Stalwart is ordered to return to the E.24 base from London by the Space Marshall to investigate why the Genamica fuel powering the new C.12 space freighters is solidifying as they return from the Moon to the S.200 space station in Earth orbit. To make matters worse E.24’s observatory reports that the S.200 has disappeared although the radio room is still receiving the S.200’s signal. Jim and his co-pilot Flight Sergeant Archie Harbottle take the Beta 1 spaceship to investigate not knowing that Jim’s younger brother Space Cadet Tony Stalwart has stowed away. In orbit they find that the S.200 has gone but a small radio transmitting satellite has been left in its place. An asteroid storm damages the Beta 1 but also pushes it to the same location that the S.200 has ended up. Finding their stowaway, the two men and the boy board the S.200 and talk to its commanding officer Major Borman who tells them of his problems with storm damage and an ill crew however as Tony explores the station he discovers an alien Satik from Saturn. 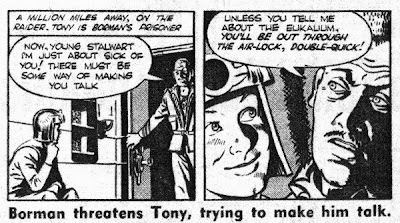 Jim and Archie don’t believe Tony but on discovering that they have been locked in their cabin, the men escape and while Archie repairs the Beta 1 Jim disappears into a ballast tank. When they realise Jim is missing, Archie and Tony search the station and discover Jim being held as a Satik prisoner. On telling Borman of their discovery, Borman pulls a hand gun on them and reveals the truth as the Satiks bring Jim to the room. On an inspection trip to the Moon, Borman had discovered a new metal with amazing properties which he smuggled on board the S.200 where crewmen were bribed into refining it. He was selling the new metal to the Satiks for a vast profit however the refining process gave off radiation which caused the fuel to solidify and Borman decided to move the station to Saturn’s orbit before he was found out. Unfortunately the asteroid storm had damaged the station. Now, obsessed by power and referring to himself as The Great Borman, he gives them 10 hours to decide between death or joining him. Escaping from their cell, Jim, Archie and Tony send a mayday from the radio room before neutralising the radiation so that they can escape in the unarmed Beta 1. As they launch, they see armed Satik ships approaching but are saved by E.24’s G Squadron who drive off the Satik vessels and then take control of the S.200. A search of the station shows that Borman has escaped justice but his new metal, called Balite, will revolutionise spaceship construction. Safely back on Earth Jim Archie and Tony are all awarded the Space Legion Medal Of Merit and Tony is promoted to Chief Cadet First Class. Note: this story was advertised in B26 as “Next Week – The Mystery Of The Green Star” however the title panel of B27 refers to it simply as The Green Star. Jim Stalwart is ordered to take command of Moon Base 1 with Archie Harbottle assigned with him and Tony Stalwart is included as part of his cadet training. With Beta 1 under repair they take an X.71 to the moon. The moon base is sealed under a transparent dome and after landing they are walking to the headquarters building when Tony saves the elderly Professor Erkintoss from being knocked down by a vehicle. To show his appreciation the Professor offers Tony a place on his expedition to the dark side of the Moon using Super Land Trucks, half tracked lunar rovers. Jim agrees and assigns Archie to the expedition as well. Setting out from Moon Base 1 the expedition sights the Green Star, a moving celestial phenomenon that has recently appeared in the solar system. While driving over the flat Cara Plateau, one of the vehicles breaks the surface crust and partially sinks. While the other expedition trucks pull it free, Tony ventures away from the site and discovers a piece of alien equipment. As he attempts to free it he falls through the crust into a chamber. Discovering that he has disappeared, Archie informs Jim at Moon Base 1 and launches a search. Jim flies to the site in a Scooter Jet, and discovers Tony by falling into the same chamber which they realise contains an alien space craft. Once they are rescued from the chamber, alien craft appear in the sky and, with two circling, one lands. As the rest watch from a distance, Jim investigates the craft alone and is suddenly surrounded by the craft’s alien crew. Attempting to rescue him, Archie and Tony are also captured and when they are taken inside the craft, the Professor orders the Super Land Trucks to be parked around the spacecraft to prevent it taking off. Inside the craft the aliens force Jim into a machine which allows them to learn English. The friendly Tukanan leader Socha warns Jim that the Moon is in great danger from the Green Star which destroyed their home world, Tuka. With time running short and the Green Star causing radio interference, the Tukanas agree to transport the expedition crew back to Moon Base 1. There Jim orders the entire base to be evacuated into space on ships and he decides to use the X.71 packed with the high explosive Tritureum to destroy the Green Star. Jim and Archie pilot the X.71 onto a collision course with the Green Star and escape in life pod as the explosion destroys the Green Star. With everyone safely back on Moon Base 1, the Tukanas are allowed to settle on the Moon by way of thanking them for their help. After their near death encounter with the Green Star, Jim Stalwart and Archie Harbottle have been assigned to rest duties in the control tower of Moon Base 1 where they are growing bored. Tony Stalwart is on his way to Mars on the Martian 1 freighter commanded by Space Captain Jock MacKenzie when the Space Marshal orders the two men to fly Police Commissioner Higgins to Mars to investigate a security leak. They lift off the next day in the Martian 2 freighter along with the Commissioner, his bumbling secretary Augustus Potts and six large canisters of Eukalium fuel. While in space they come across seven men floating in their spacesuits and on bringing the barely conscious men on board, discover that they are Jock MacKenzie and the crew of the Martian 1 but Tony is not with them. Jock warns them of the Black Raider, a spaceship that suddenly appeared from behind a radiation cloaking shield and attacked them. Now a prisoner on board the Black Raider, Tony is taken to see its commander Major Borman who now styles himself as an Admiral. 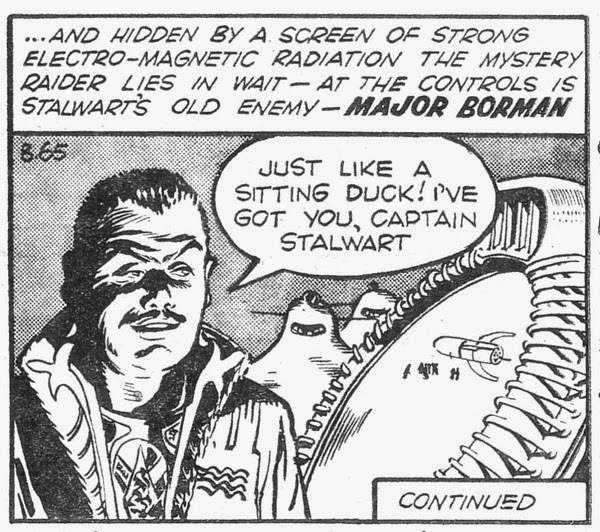 Borman uses the Black Raider to attack Jim’s Martian 2 with a freezing ray but Tony is able to switch off the ray before the crew of the Martian 2 are overcome and Jim prevents Archie from firing on the Raider as Tony remains on board. 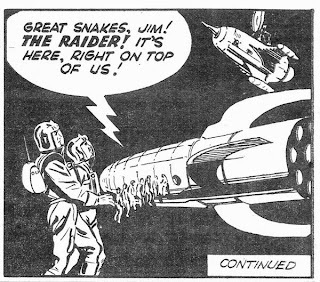 With Tony restrained, the Black Raider attacks the Martian 2 a second time and successfully freezes the crew. Borman’s deputy, Leffman, boards the Martian 2 with alien Satiks to get the cargo of Eukalium but Jim is able to move enough to fire at the Raider and destroys its freezing weapon. As the Satiks escape, Leffman is left trapped on the ship. 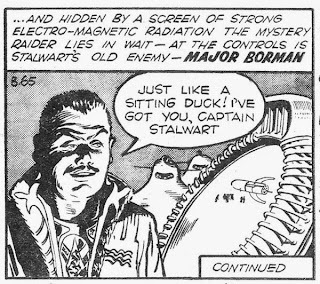 Borman now offers his hostage, Tony, for the Eukalium cargo but Jim refuses and Borman makes his escape with the captive Tony in the now invisible Raider. Interrogating Leffman, Jim discovers that Borman’s base is in the Asteroid Belt and the Space Marshal assigns him a squadron of fast Gamma spaceships to hunt Borman down. Jim follows a trail of wreckage from the Raider towards the Asteroid Belt. Note: This is where the strip concluded in the final issue of Junior Mirror. 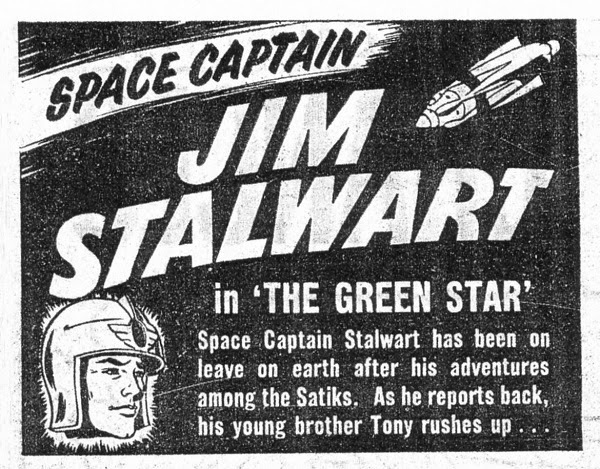 However the conclusion of the story was printed in text form below that week’s Stalwart strip under the heading “Now Read How Jim Stalwart’s Adventure Ended”, and included two panels from what would have been the next issue’s comic strip which would have been C76. Tony refuses to give Borman any information on the Moon’s supply of Eukalium and Borman puts him in the captured Martian 1 on course for the Satiks on Saturn. Jim rendezvous’ with the Gamma squadron and leads them through the Asteroid Belt to recover Tony from the Martian 1. Tony has planted a tracking device on the Black Raider which means that Jim and the squadron are able to find and attack the ship. Borman uses a spacesuit to get to the Martian 2 before his ship explodes and he is arrested to stand trial for his crimes.